Fructose intolerance is your body's inability to break down fructose and results in your blood sugar levels dropping very low. Your liver may also not operate efficiently. Fructose is used to sweeten foods and is also present in fruits and honey. In general, foods with added fructose have little nutrition and are best limited in our daily diet. Whole fruits are healthier choices than fruit juices, and vegetables are optimal if your body does not tolerate fructose. 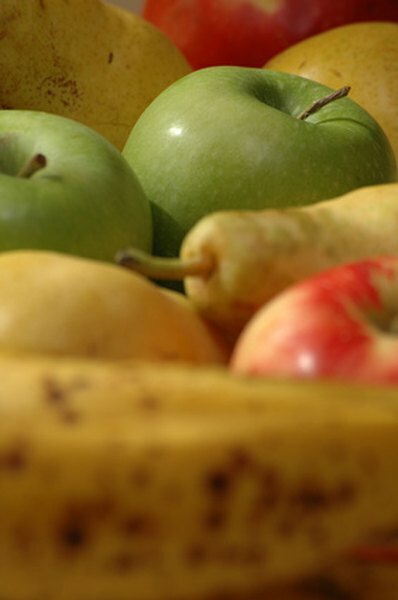 Fruits that are high in fructose such as apples, pears, cherries, prunes, plums and fruit juices should be avoided. Other fresh or frozen fruits with natural fructose, when eaten in small servings, may be tolerated. These include pineapples, bananas, oranges, berries and avocado. Lemons and limes are helpful for digestion and may also be accepted in small quantities. Canned fruit might not be a healthy choice in any quantity since often contains too much sugar. Most vegetables are okay on your fructose intolerance food list. Especially if they are cooked since sugars that are present are mostly lost during heating. A 1-cup serving size of green leafy vegetables is healthy to eat daily. More servings of vegetables than fruits are recommended. The University of Virginia Health System lists broccoli, green peppers, spinach, cucumbers, peas, beans, asparagus, celery and mushrooms as vegetables for your daily diet choices. Serving sizes of tomatoes, sweet potatoes, corn and carrots may need to be limited. Meats and most dairy foods are healthy choices since they do not contain high amounts or any fructose. Ice cream is an exception and should be avoided since it has more sugar. Desserts and processed or packaged foods that are made with white sugar and white flour should also be avoided. Eating sorbitol, a form of sugar that is also present in fruits and used in sugarless or diet foods, may result in challenges similar to fructose intolerance and should be avoided if that happens. Many drinks contain fructose including fruit juices, sodas, flavored water, sports drinks and sweetened milk. You should cut these from your diet or limit your daily consumption. If you drink them with a meal they may be better digested. Plain water is healthiest to drink if you are fructose intolerant. Sugar alcohols such as sorbitol, sorbose and xylitol found in many diet drinks should be avoided since they can create the same symptoms as fructose intolerance.